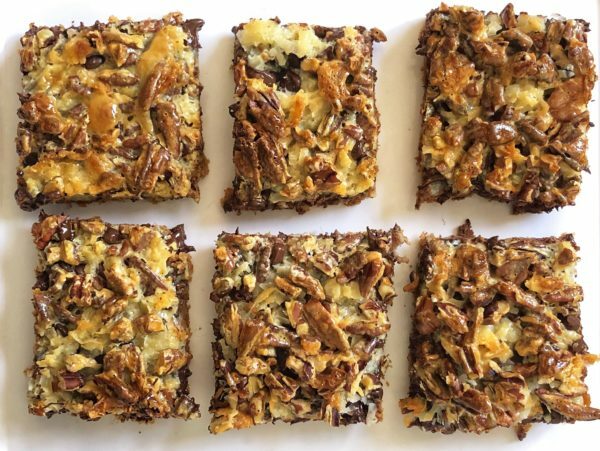 I know that these six layer cookie bars are sometimes called magic bars, which is accurate because they really are quite magical. As I’ve been trying to bake my way through my Grandma’s recipes, I’ve realized that about 75% of the box are desserts, which is not doing any favors for my waistline…especially since I have no self-discipline when it comes to desserts. Next week I’m going to try to force myself to make one of her recipes that doesn’t have sugar in it. We’ll see how it goes. Growing up my siblings and I used to call these ‘Uncle Bruce bars’ because we didn’t know their real name and our fun Uncle Bruce would always make them whenever we took a big Brown family vacation to the beach in California. Not only are they full of buttery chewy chocolate deliciousness, but they are super easy to make and a good dessert for a big crowd. When I first looked at this recipe I had to read it a few times to make sure I was reading the first sentence right…to me it sounded like I was supposed to put the butter in the 9×13 pan and actually put it on the stove to melt the butter. So that’s what I did. I just turned on one of the big burners and kind of moved the pan back and forth every few minutes until the butter was all melted. I’m still not sure if that’s exactly what my grandma meant, but it did work :). I suppose the most important part is that the butter is melted, so if you don’t want to put your pan on the stove you could also melt the butter in the microwave and then pour it in the pan. A few other things to note: For me, 2 cups of graham cracker crumbs equaled about one and half sleeves of graham crackers, which I just put in a ziploc bag and smash with a cup until they were fine crumbs. Since I’m kind of a lazy baker, I also didn’t actually measure out the coconut, the nuts (I used pecans) and the chocolate, I just sprinkled them until they formed an even layer in the pan. Since I tend to favor nuts and chocolate over coconut, those two layers were a little heavier than my coconut layer. Normally I don’t really like desserts with coconut, but I will pretty much eat anything if it’s smothered in sweetened condensed milk. Plus in these bars you can’t really even taste the coconut – it kind of blends in with the chocolate and just provides a great chewy texture. In other versions of this recipe I’ve seen people do seven layers and add butterscotch chips, which you could certainly do if you want to spruce them up more, but I think the six layers in these provide just the right amount of richness. Oh and one more thing – my Grandma’s original recipe said to bake them for 35 minutes, but I found that it made the edges of my bars a little more crispy than I would like, so I adjusted the time to 30 minutes. They may seem super gooey when they first come out of the oven, but just give them some time to cool and they will form into nice chewy bars. Rich and chewy graham cracker crust bars with chocolate, nuts and coconut. Melt butter in 13x9x2" baking pan over low heat. Remove from heat; sprinkle graham cracker crumbs evenly over melted butter. Then sprinkle with coconut and an even layer of chocolate pieces. Pour sweet condensed milk evenly over layers. Top with nuts (do not stir). Bake in 350 degree oven for 30 minutes or until done. Cut in bars. Makes appx. 20 bars. Thanks for trying out this recipe! I’m definitely no expert in baking, but it’s been really fun for me to work my way through my Grandma’s recipes so far and to follow her expertise. I know that there are probably tons of variations all over the internet of these six layer bars, but sometimes it’s just cool to be able to make something that my Grandma used to make when she was alive. That maybe fifty years ago she had the same sense of satisfaction as she pulled them out of the oven and her kitchen filled with that glorious baked butter smell. That maybe she had problems with self-indulgence and always ate one or two more cookies than she intended, too :). For the last couple of years I’ve actually been on a hiatus from baking…in an effort to be more healthy I actually avoided buying flour and sugar for a year so that I wouldn’t be temped to bake. It was a good experience for me to kind of tame my sugar addictions, but I did miss the process of baking. I definitely think that’s true. There’s something very magical and therapeutic about putting a bunch of ingredients together and having them transform into a delicious creation, especially if it’s a well-loved family recipe :).